The BD FACSymphony™ system is a novel cell analyzer that leverages the inherent benefits of flow cytometry and enables the simultaneous measurement of up to 50 different characteristics of a single cell. This high parameter flow cytometer is a powerful analytical tool that enables scientists to identify and analyze distinctive phenotypes in heterogeneous populations. 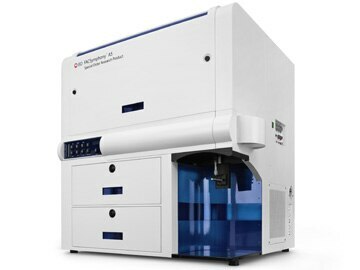 The BD FACSymphony analyzer features innovative designs for both the excitation optics and collection optics that reduce excitation losses and improve light-collection efficiency. Our high parameter custom reagent program is specifically designed to cater to the needs of researchers looking to achieve flow cytometry analysis using more than 20 parameters.